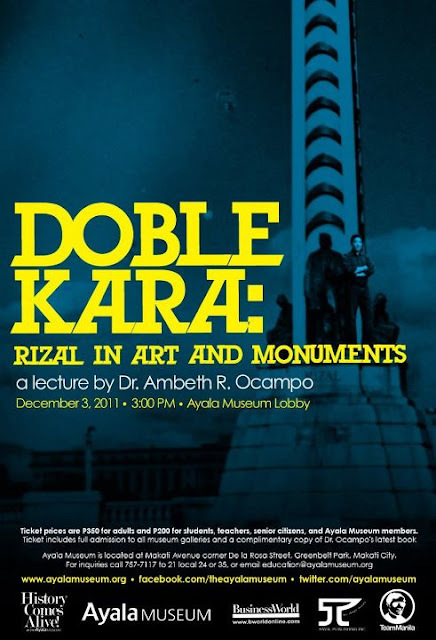 Dr. Ambeth Ocampo's "Doble Kara: Rizal in Art and Monuments," lecture last December 3 was the last in his 2011 History Comes Alive! series. David Beckham was in the Philippines, playing with the Azkals, but Ambeth's loyal fans couldn't care less. (FYI: I mean no disrespect. For some reason, I feel more comfortable calling him Ambeth rather than Dr. Ocampo -- well, probably not to his face hehe). Anyway, the lecture was still well-attended and was as lively as the previous ones (see here and here). Ambeth's slideshow included photos of several Rizal monuments. Before seeing those pictures, I did not know that there were so many Rizal monuments around and that some of them looked a bit goofy. The history of the Rizal monument in Luneta was also discussed, from the time it was commissioned to the time it was modernized. It was my first time to see that towering steel pylon they erected in the 60s. Good thing they removed it a few years after, since it looked out of place and made the Rizal statue look like a footnote. One thing Ambeth mentioned that surprised me was the heroes' ages when the Gomburza priests were executed: Rizal (11), Bonifacio (9), Apolinario Mabini (8), Antonio Luna (6), Emilio Aguinaldo (3), and Gregorio del Pilar and Emilio Jacinto were not even born yet. I never really thought about that and never did the math. I knew Rizal was inspired by the execution to write but I just assumed that he was a lot older and thus more mature when the execution happened. It was a little jarring to be reminded that in the old days, kids were aware of the big issues around them and that people in their late teens and early 20s were already mature men and women who had accomplished a lot; nowadays, they're still boys and girls -- kids -- whose main concerns are cellphone and Facebook. Anyway, Ambeth also recounted that Paco Park tried to build a women's toilet on top of Gomburza's graves. He intervened by appealing to then-Mayor Alfredo Lim whose prompt action led to the removal of the comfort room. As with the previous lectures, time seemed to fly. We're looking forward to more lectures in 2012! ha, so you are an Ambeth Ocampo fan. I have met him three times and we're FB friends :))) He also imspires me. His books are literally light hehe. Thin pocketbooks. So unlike the typical thick textbooks associated with historians. Ambeth Ocampo is the rock superstar in the field of history. True. I was "napilitan" to attend the first lecture, expecting it to be boring. I was surprised to learn that the lectures were engaging and fun. I bought one of Ambeth Ocampo's books and I tell you he does make history very interesting to read. I think teachers should emphasize heroes' ages to their students. Nowadays, many people consider "youth" as an excuse to not excel or to not care. this is another very nice read post coz very informative and timely for me too! as you know i am doing the Lakbay Jose Rizal @ 150 passport heritage trail and getting amazed at the new things i am learning about our national hero during his pre-national hero days. your posts on Ambeth Ocampo's lectures are complementing it so thank you. I am hoping to write the experience of the trail for a magazine and deadline is tomorrow but i still haven't written a single line. Not sure how to begin in and your post helps somehow. thank you.